While we're excited to share our love of bowls with everyone, we also realize that not everything is for public consumption. To address that, we have created a secure site for members of the club. 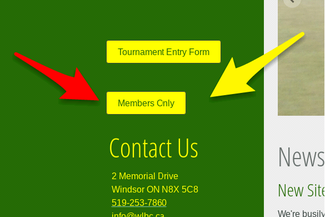 If you click on the "Members Only" button on the left hand side of the screen, you'll be taken to our secure site. The first time you go to the members' site, you'll have to sign up for an account. All registrations are manually verified by Jason, so you might not get access immediately. Once you are verified, you'll be able to log in and see documents that had previously been distributed by email. Currently, you'll just find copies of our articles of incorporation, by-laws, and complete contact information for directors. We'll be adding appropriate content as the season progresses. Please note that the members' site is hosted by a different system than our main website. This is because our main website platform offers a lot of things that we like, but does not offer a secure login page for members. We are pointing this out because the members' site will have a different address and different appearance than the main site. With concerns over phishing, we wanted to make sure we addressed things before people got worried.